A voyage to the sun would not be a pleasant trip. While still a million miles away, the tungsten hull of our spacecraft would start to melt. At half a million miles, it evaporates. A little farther and we’d be nothing but swirling plasma, mixing into a nuclear furnace so vast that “oceans” would be an understatement. Though we could never touch the sun, there are stars that you can touch— former stars, anyway— and one has recently been discovered [link to paper]. It is only four thousand light-years away (16.1 years traveler time; see “We Can Get There from Here”). This star has been transformed by its neighbor into a husk of cold diamond. Since it’s solid, some astrophysicists are calling it a planet, but it’s not clear that the word applies to an object with such a bizarre history. Suppose that we take the 16-year trip to visit this world: what would it look like? Could we really stand on the heart of a dead star? Stars are the universe’s vocation: they finish the job that the Big Bang started. In the first minutes of cosmic expansion, the entire universe was a burning plasma— nuclear interactions were happening everywhere, like the core of a star, but infinite in all directions. It ended quickly, though. 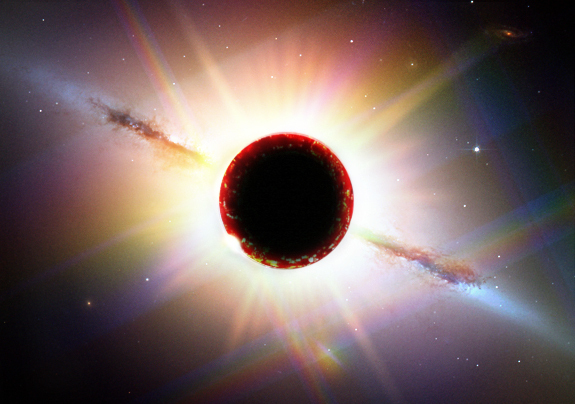 As space expanded, this universe-filling plasma cooled. After about twenty minutes, all nuclear reactions had ceased. In that first half-hour, most of the universe’s helium was made. All of the matter in the universe was initially free protons and neutrons, but the extreme temperature allowed them to fuse into deuterium (one proton and one neutron), tritium (one proton, two neutrons), and helium (two protons, two neutrons). The process would have continued, building more complex nuclei than helium, but the fire went out too soon. If the universe had been expanding a little more slowly, it could have built lithium (three protons), beryllium (four protons), and so on, but as it was, only a tiny amount of lithium was made. After that, nothing. It took another four hundred thousand years for matter to cool enough to turn from a glowing plasma into an invisible gas: space has been dark ever since. For millions of years, the hydrogen and helium (and smidgen of lithium) that were formed in the Big Bang streamed into the darkness. After at least a hundred million years, gravity, the weakest of the fundamental forces, started to gather matter into clouds. Gravitational accumulation is a run-away effect: as clouds get denser, their gravitational force gets stronger, so they get even more dense. Eventually, gas was pouring into the gravitational wells so quickly that they were heated by their own pressure. The gas became plasma, and the plasma started to burn: nuclear reactions began anew. This time, the burning was limited to a few points of light in the sky, and was sustained. In these first stars, the process of building heavy elements from light ones picked up where it had left off: free protons (hydrogen) made more helium, hydrogen and helium combine to form lithium, helium and helium make beryllium, and so on, building up all of the elements. Since stars live for billions of years, they even produce nuclei with hundreds of protons and neutrons. We’re made of heavy elements (heavier than helium), so that’s where we come from, the bellies of stars. The energy released by these nuclear reactions counter-balance gravity: as gravity pushes in, pressure pushes out. Stars are a bit like balloons— the elastic surface of a balloon pushes against the pressure of the air trapped inside. A truce is established between push and pull that keeps the balloon from shrinking or exploding. Stars hold their form for a few billion years, but eventually the outward pressure drops when it runs out of fuel. They can go through several stages of shrinking, creating higher pressures to unlock a new reaction, burning that for a while, and shrinking again. But there’s a limit. Eventually they drop so deep that they hit a completely different and unyielding source of pressure from quantum mechanics. They bounce and burst. These are novas and supernovas— the explosions that spewed most of the heavy elements into space— that’s how we got out of the bellies of stars. What’s left behind falls back down and comes to rest against the hard wall of quantum mechanical pressure. This quantum mechanical pressure is completely unlike the pressure of a gas; it is due to the mere fact that all electrons or neutrons are perfectly identical. Pressure from burning fuel cannot last forever, but quantum mechanical pressure does. If the star has enough mass, it can become a black hole, forever; if not, it will become a white dwarf (electron pressure) or a neutron star (neutron pressure), and stay that way forever. 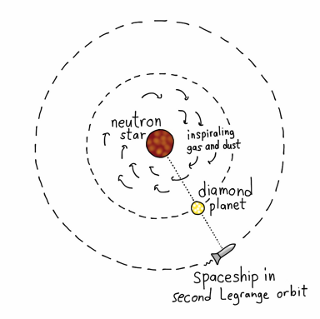 The recently discovered “diamond planet” orbits a small neutron star. 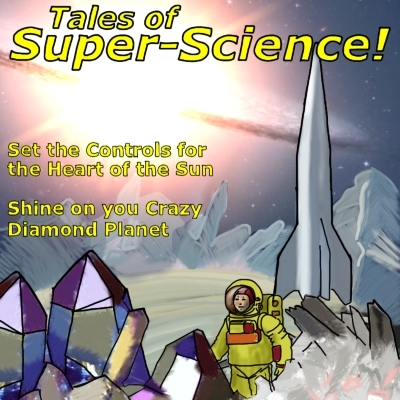 The diamond planet is the result of an unusual situation. A long time ago, a pair of stars ended their lives as a neutron star and a white dwarf. They were very close, so close that the outer atmospheres of the stars nearly touched, and the neutron star tore the atmosphere off of the white dwarf. Astrophysicists call these neutron stars “black widows.” Usually, this would destroy the white dwarf, but PSR J1719–1438 and PSR J1719–1438-b are an unusual pair. If the white dwarf was a carbon white dwarf, a class of stellar remnants with a high concentration of heavy elements and a particularly small mass, then it could have lost its atmosphere slowly enough to form a heavy, carbon-rich core while drifting to a slightly larger orbit, and thus escape complete destruction. What has been observed orbiting the neutron star is a small (Neptune-sized) object which is extremely dense, at least 23 g/cm3. That’s three times the density of iron, close to the density of iridium. If it really was a carbon white dwarf, then it would now be a planet-sized diamond. That’s interesting enough to warrant a trip. What would we find when we get there? The first thing we know about the system is that the neutron star is rapidly emitting radio pulses: that’s how it was discovered. Each pulse comes from a revolution of the neutron star around its axis, the way that the Earth revolves around its axis once a day. However, the neutron star’s days are very short— pulses are 5.7 milliseconds apart. It sounds more like a buzzing than distinct clicks. The radio signal is very weak when it reaches Earth, only 2×10−30 W/(m2 Hz) of radio power. Extrapolating from 4,000 light-years (Earth) to about 50 thousand miles (the distance of the diamond planet from the neutron star), we get 400 W/m2, which is like standing a few feet from a strong FM broadcasting antenna. We (and our electronics) could survive that, and most of the neutron star’s radio power is directed in beams out of its north and south poles. These beams might not even be pointing where we’re standing. Neutron stars are famous for having extremely strong magnetic fields, though this one is relatively weak: at most 20 thousand Teslas (only 200 times the strongest field ever produced by humans). Moreover, these large numbers represent the magnetic field on the surface of the neutron star, and if we’re investigating the diamond planet, we’ll be thousands of miles away. The magnetic field is hardly noticeable. Neutron stars don’t shine because their nuclear reactions have long since extinguished. However, the gas and dust spiraling into them gets very hot and bright due to friction, sometimes hot enough for nuclear reactions to flare up. Unlike our sun, which only has nuclear reactions in its core, these reactions are not moderated by having to pass through thick layers of gas. They would therefore be very energetic, with a lot more ultraviolet and X-rays than infrared (heat) and light. The infalling gas may be clumpy, so the brightness could flare and fade like a bad candle. Six-day sequence showing a huge X-ray flare from a neutron star (SGR J1550-5418, which is especially energetic). As the X-rays propagate outward, they illuminate the surrounding dust clouds— that’s why it looks like an expanding ring. Smaller flares take only minutes. No X-ray flares from the diamond planet’s neutron star have been seen from Earth, so all we know is that it is less than 600 times as bright as the sun. (From Earth, it would be a 25th magnitude star or dimmer.) To be safe, though, we should bring strong visors. What about the diamond planet itself? What would that be like? Its size is fairly well determined by its distance from the neutron star: it’s about two-fifths the size of Jupiter, 20 thousand miles. Its mass is unknown, but at least the mass of Jupiter, a trillion trillion tons. Putting these together, the surface gravity would be at least 15 times Earth’s gravity. That would be very uncomfortable, but not instantly fatal. 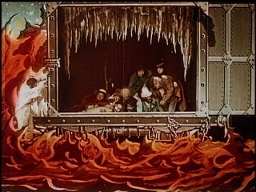 Above 12g, the subjects lost their vision (“they could only see dark clouds with stars, etc.”) and were only capable of “simple manual switching operations using the hands and fingers.” The best chance of surviving the visit would be on our backs in a stretcher, and the whole operation— landing, collecting samples, and taking off again— would have to be completed in a minute or less. Perhaps that is unrealistic. Perhaps the surface would have to be explored by robots, while we watch from above. They’ll bring back samples. The second Lagrange orbit would be a comfortable place to sit and watch. This orbit is just outside the planet’s own orbit around the neutron star and takes just as long: 2 hours and 12 minutes. Since the planet would always be between us and the neutron star, it can protect us from unexpected X-ray flares. It may also be the most beautiful place in the universe. Diamond is transparent: imagine what the neutron star would look like when eclipsed by a planet-sized gemstone. The disk of gas swarming into the neutron star would look like a hurricane, with flashes of thermonuclear blasts searing the clouds like lightning. All of this light would filter through the planet and around its edges, refracted into rainbows. If you’ve ever seen 2001, a Space Odyssey (1968), have you noticed how pale and featureless the planets are? Especially Jupiter— several rounds of space-probes have revealed Jupiter to be vibrant with deep textures and rich contrasts, yet Kubrick’s Jupiter looks like a cloudy day. Each generation of probes and telescopes unveils a universe more resplendent than the last, so whatever it is that’s orbiting PSR J1719–1438, I’ll bet it’s far more awesome than we imagine.